Designers of Counted Canvaswork can be hard to find. I've listed the websites and/or contact information for all the ones I know about in alpha order, including teachers of counted work who occasionally sell their charts to the pubic. Please note in many cases you will have to buy their works from a shop as many don't sell directly to the public. There is a list of shops that have a lot of charts available on a separate tab or you can click here. I don't do counted pieces much myself so please help me keep this up to date by sending me new information and updating the old. Thanks! Needlepoint Now magazine's index will help you locate free designs from counted designers. Primarily a painted canvas designer, Abigail Cecile has small but cute counted designs in her Etsy store. These are great for a travel project or to teach a new stitcher. Ann's Razzle-Dazzle is a classic. These little furniture pin cushions on Congress cloth are her design. A fabulous stitcher, Arlene never saw a type of needlework she didn't want to try. She sells some of her original designs as charts on Etsy. Visit her website (second link below) to admire her stitching of other folks' designs. By the way, her charts are now available via Hoffman Distributing. Many of Arlene's designs are available in several versions. 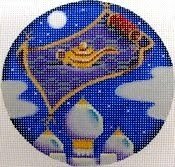 Her Gossamer Lace can be done in cross stitch or in blackwork, for example. The Central Kentucky Chapter of ANG has a new fund raiser chart-"The Red White and Blue." If you love charts or love patriotic designs, this one is for you. Message Karen Barras on Facebook to purchase. I know nothing about this company or designer except I've seen geometric charts that seem to be based on quilt patterns under this name on eBay. Sorry, the Dakota Rogers website appears to be defunct but she does have a Facebook page. Mostly counted thread but some designs are intended for counted canvaswork. Note the free chart offer in the right hand column. Here's another free chart. Her website is defunct so try a Facebook page. Here are three of Deborah's new "Labyrinth" series. Use the side arrows to navigate. Sally does both painted canvases and charts, some charts are re-released from her 1970s books which are out of print. I think PDF versions of her charts are available from her Etsy page. Diane's "Walking the Water's Edge" is a classic. Her designs are only available as classes, although some places allow ghost stitchers and she has taught cyberclasses. Diane is Canadian and teaches all over at Canadian guilds and seminars, but she doesn't appear to have a website or blog. Here are photos of some of her designs as finished models. You can view Dorothy's work on her Facebook page. This now defunct silk thread company published charts and kits to promote their silk under the Eterna Silkits name. Here are two of the three Ginko Leaf designs. I believe there were several larger kimono patterns. Ada mostly designs painted canvases but some of her work has been turned into charts for cross stitch. They'll translate into counted canvaswork pretty easily I think. Contact her via her Facebook page. Browse her Etsy store for charts for various types of needlework or her website for free designs. Jim's charts and teaching pieces are available exclusively from Threadneedle Street in Palm Desert, California. Email Marianne at ThreadSt@AOL.com as the shop doesn't have a website. Don't miss Joni's fabulous informative blog! Note that Liz has several free designs available. I think she teaches at ANG chapters but have not been able to find any contact information. Merrilyn specializes in counted work and online classes and kits. This chapter sells original charted designs as a fund raiser. Their current charts are a series of hearts on their home page. Their "Hats Off to Halloween" witch hat spiral bound book was very popular several years ago and still a classic Halloween series. Nancy doesn't have a website but she does have a Facebook page where you can contact her. 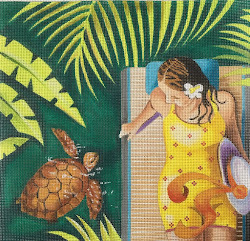 A designer of dollhouse rugs meant to be stitched on silk gauze, Natalia has quite a few free patterns that will work on larger ground fabrics like needlepoint canvas and Congress cloth. 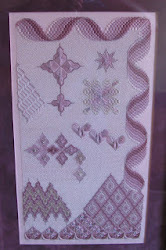 She also sells kits to stitch some of the free patterns if you don't have a source for threads and ground fabrics. The designers also offer cyber classes. Peg Dunayer Designs (famous for her clever needlepoint etui boxes and quilt patterns, some of which were published in Needlepoint Now magazine) - Note that her website has disappeared. His website is no longer active. Look for his charts in various online stores and on eBay. Sharon Quick is now selling Ro's charts for her. You may email Sharon to ask what she has available at bg4458@earthlink.net or you can contact her via her Facebook page. Sharon's Facebook page has a photo album of Ro's charts, by the way. I am told A Stitching Shop in Denver also sells Ro's charts. They don't have a website, just a Facebook page. Their photo number is 303/727-8500 and their hours are 10-5 p.m. Monday-Saturday. Their email address is AStitchingShop@gmail.com. Sally does both painted canvases and charts, some charts are re-released from her 1970s books which are out of print. I think PDF versions of the charts are also on her Etsy page. Although now more famous for her painted canvas designs, Sharon Garmize started out in the 1980s designing miniature rugs and working custom pieces for doll house collections on silk gauze. It's worth trying to find some of her rug charts on eBay. You can see one stitched here. Sharon no longer sells the charts although you might enjoy a visit to her SharonG.com website to look at her painted canvases. Quite a few f Susan's charts are in Needlepoint Now magazine but you can see "Heart of the Cabin" here. ATTENTION: Jan plans to shut down her website on December 31, 2015. Composted of Ann Caswell, Suzanne Howren and the late Beth Robertson, these three teachers and authors have some interesting charts and also painted canvases (often with stitch guides). A fabulous stitcher, Arlene never saw a type of needlework she didn't want to try. She sells some of her original designs as charts on Etsy. Visit her website (second link below) to admire her stitching of other folks' designs. By the way, her charts are now available through Hoffman Distributing. This painted canvas designer also has at least three counted canvas projects. Here is the third on Facebook. Contact Zecca via their website for more information (second link below). Thanks for the update, Susan. I'll change the link right away! Could you please locate, if possible, a site for Wanda Linsley, creator of Dresden Kitty and other pulled thread creations? I used to be with EGA, but the chapter closed years ago. We never did anything by her, and EGA doesn't list her e-mail address, and searching online has proved futile. I'd like to purchase Dresden Kitty if/when it becomes available after EGA retires it this December. I'll see if EGA has an contact information for Ms. Linsley. Give me a day or two to get an answer back, ok? Anon, I've heard from Wanda Linsley who is on the road right now. She says she'll email me contact information when she gets home again. Stay tuned! Does anyone have a contact for Alice Okon? We would like to do a program at my guild of one of her designs.